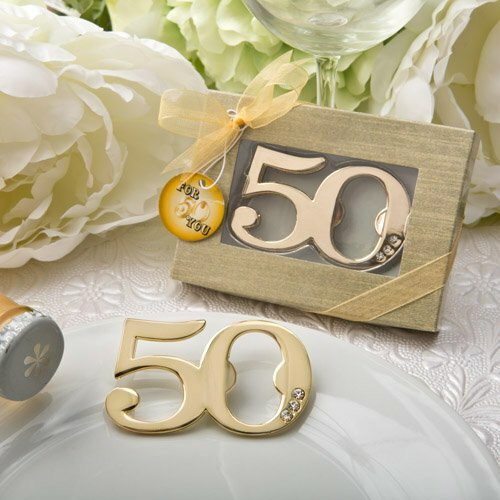 This magnificent gift makes a perfect favor for a 50th birthday party or a 50th anniversary. Celebrate the big Five-O in style! 50 is a meaningful occasion, be it a birthday or an anniversary and you need to make a big deal out of it! These stunning bottle openers are sure to enhance the ambiance of your event venue. The numbers are molded from all metal in the shape of a large 50 with a golden finish. Three sparkling rhinestones add a special touch to the classic design. The open number zero doubles up as a strong bottle opener. Your guests will be thrilled to receive one of these bottle openers as a favor and are sure to keep them close by long after your event is over. They make useful and stylish picnic, barbecue and outdoor occasion gadgets. Size is 2 5/8" x 1 1/4" Number 50 open design bottle opener Molded all metal for strength with gold finish Three rhinestones add sparkling detail The open number zero contains bottle opener Packaged in gold tone box with clear top Gold organza ribbon wrap and bow with gold 50th design 'For You' card A fabulous favor for a 50th birthday or 50th anniversary!